Every time I’m back in Bayswater, I still get that warm and fuzzy sense of nostalgia of my Imperial College days having spent a couple years as a W2-er back in my uni days. If there’s one thing I miss most about the area, it’s the large cluster of neighbourhood restaurants in and around the Queensway-Westbourne Grove area, featuring all sorts of food from Chinese to Polish to Persian. In amidst this United Nations of eateries though is a neighbourhood gem that’s championing the best which British cuisine has to offer. 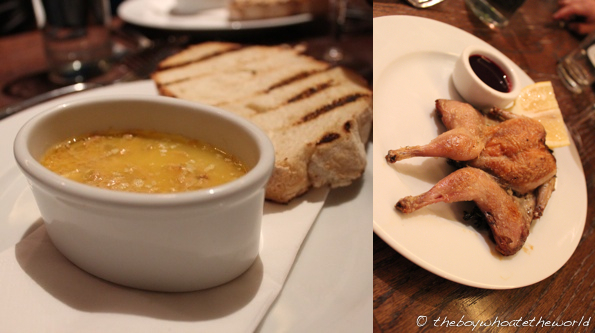 Hereford Road is all about honest, no-nonsense British grub. Opened in 2007 at the site of a former butcher’s shop on it’s namesake road, it’s run by Tom Pemberton who (un)coincidentally used to be head chef at Spitalfields’ St John Bread and Wine, my current neighbourhood’s flag-bearer for British food. As far as the simplicity of food goes and the use of off-cuts, there are obvious parallels that can be drawn between the two ventures. But for me, there is one very important difference. Whereas I’ve often found food at SJB&W can be a tad bland and underwhelming, Hereford Road delivers hearty, tasty dishes like no other. The ever-changing daily menu here includes starters which range from the classic Potted Crab to more off-piste options such as Lamb sweetbreads (and Lamb brains even!). Not the biggest fan of offal, I opted for a very safe-sounding Roast Quail with Damson. And when the Quail is as plump and juicy as the bird they’ve managed to source here, there’s no need for messing around with fussy marinades or intricate spices. A big wedge of lemon on the side and a light sprinkling of sea-salt and black pepper was all there was to it. To accompany, a small dish of ruby-coloured Damson sauce that was clean and full of sharp, ripe-plum flavours. Not the prettiest of plating by any means, but it was simple, ‘less-is-more’ grub. If the starters bring a smile to your face, wait till you get a look of the main courses. Braised Shoulder of Roe Deer which I shared with E was quite literally the length of a base-ball bat… spilling out of the huge platter it was served on. Slow-cooked for what must have been several hours at least, the meat fell off the shoulder blade with the touch of a spoon and the gravy, carrots and shallots melted away in the mouth like butter leaving layer after layer of flavours from the gamey venison and sweet carrots. 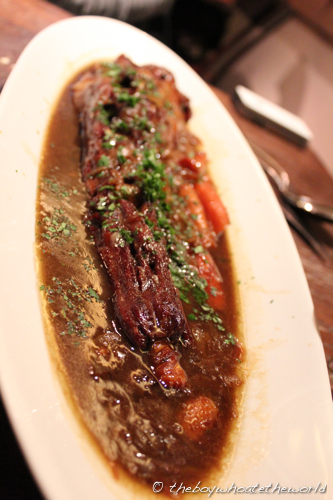 The same went for the Ox-tail which W and S shared. 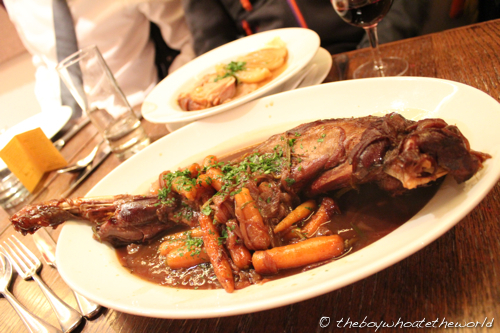 Instead of the usual cross-sectional chunks you come to expect of Ox-tail, the tail was served up rustically in it’s full-length glory… the meat so tender it was falling off the tailbone. Some of the heartiest food I’ve had all year round. 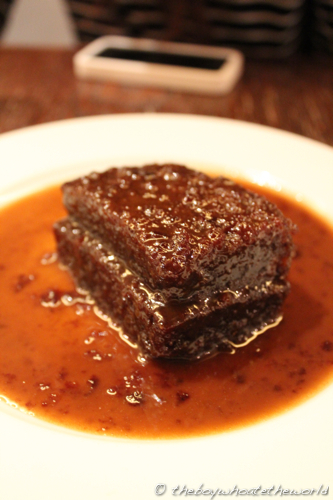 …the best Sticky Date Pudding in the wurl. The pudding was spongy yet firm… the flavour of dates was subtle… and drenched all over was a beautifully balanced sticky-toffee sauce that was smack-on the sweet-spot of semi-burnt caramel and sugar. The flavours were so incredible, I find myself still in withdrawal from all the toffee goodness… ordering anything and everything toffee-related I can get my hands on ever since. A stonkingly good meal on the whole. To top it off, service was warm and very efficient – we felt extremely well looked after by our waiterss from the moment we sat down to the very end. Damage-wise, the bill came up to a very reasonable £30 a head for the 6 of us, including a very decent bottle of Tempranillo. I’ve been wanting to visit this place for ages but it never seems to be the area I venture too often…..
tofufa: same for me really. Hardly every find an excuse to be back in West London these days where i was a uni student, but I think its definitely worth the trek!